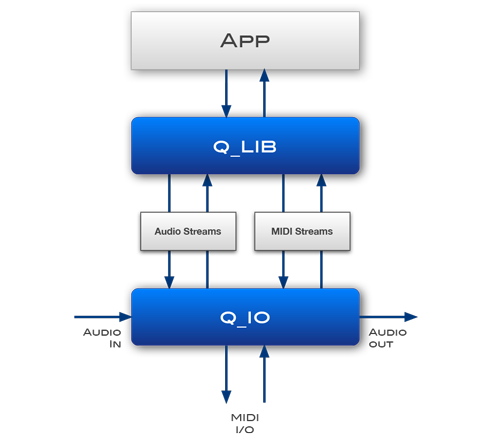 Q is a cross-platform C++ library for Audio Digital Signal Processing. Aptly named after the “Q factor”, a dimensionless parameter that describes the quality of a resonant circuit, the Q DSP Library is designed to be simple and elegant, as the simplicity of its name suggests, and efficient enough to run on small microcontrollers. Q leverages the power of modern C++ and efficient use of functional programming techniques, especially function composition using fine-grained and reusable function objects (both stateless and stateful), to simplify complex DSP programming tasks without sacrificing readability. Q is the host of some experimental Music related DSP facilities such as Virtual Pickups (Virtual pickup placement simulator) and Bitstream Autocorrelation (An extremely fast and efficient pitch detection scheme) the author (That’s me! :-)) has accumulated over the years as part of research and development, and will continue to evolve to accommodate more facilities necessary for the fulfillment of various Music related projects. The library is Open Source and released under the very liberal MIT license. q_lib: The core DSP library, which has no dependencies except the standard c++ library. In the future, it is possible to make use additional libraries, as long as the libraries depended upon are also self-contained. q_lib is a no-frills, lightweight, header-only library. q_io: Audio and MIDI I/O layer, with very minimal dependencies (portaudio and portmidi) and very loose coupling via thin wrappers that are easy to transplant and port to a host, with or without an operating system, such as an audio plugin or direct to hardware ADC and DAC. By design, communication to and from the application, including but not limited to parameter control, is done exclusively via MIDI. We will track the development of the forthcoming (as of January 2019) MIDI 2.0, especially extended 16-bit and 32-bit resolution and MIDI Capability Inquiry (MIDI-CI) “Universal System Exclusive” messages. The architecture intuitively models real-world (hardware) effect processors (and synthesizers) with a) zero or more input channels and one or more output channels, and b) a means for communication and control via MIDI. Such design simplicity is fundamental. There is very clear separation of concerns. There are no graphical user interfaces. There are no direct hardware or software controls. User interface is outside the scope of the library. You deal with that elsewhere, or perhaps not at all. Such design simplicity makes it easy for applications to be incorporated in any hardware or software host. MIDI is a very simple protocol with a well defined and evolving standard. The ability to use any MIDI controller (again both hardware or software) to control an application is a very powerful and intuitive concept. It is the very concept that gave MIDI widespread appeal and ubiquity to begin with. This simplified control scheme using MIDI also allows applications to be easily testable in isolation —a very desirable capability not typically found in more complex and monolithic systems.